Drake’s Brewing Co. is expanding outside of the East Bay for the first time with a new Sacramento area location — and it also just happens to be in an architectural landmark. Drake’s Barn will open to the public Wednesday, October 24. Set along the Sacramento River on the West Sacramento side, the Barn was initially envisioned as a community gathering place for a still-developing part of town. 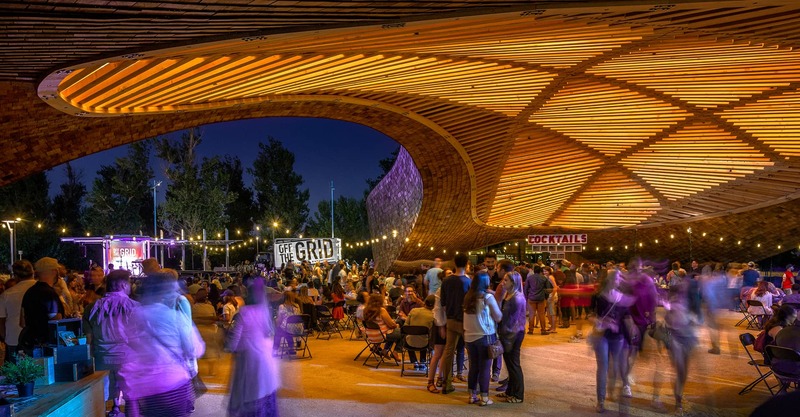 It’s a two-acre site capable of holding festivals, concerts, and other big events, with the focal point being a curvy cedar pavilion designed by Dutch architect Jerry van Eyck. Fitting with Sacramento’s agricultural landscape, the shape is inspired by a sprouting vegetable seed, and it received a first place International Design Award for architecture in 2017. Originally, the team behind popular Sacramento beer bar LowBrau was supposed to open a restaurant at the Barn, but they ran into some financial challenges. Drake’s Brewing was then tapped to take over. At Drake’s Barn, there will be PizzaSmith, a full-service restaurant, as well as an outdoor bar and a 400-seat beer garden. Food trucks will flock on the weekends — the Barn has hosted a number of Off the Grids already — with a large open meadow, three music stages, and fire pits surrounded by lounge seating. This winter, a 38-seat cocktail bar will join the mix, with more amenities promised through 2019. Executive chef Taylor A. Smith of Oakland’s Drake’s Dealership is behind the PizzaSmith menu. It’ll follow the winning formula of Drake’s Dealership with 14 wood-fired New Haven-style pizzas featuring a range of unconventional toppings, such as smoked trout, Sriracha, and pickled goathorn peppers. There will also be small bites and larger plates, such as vegetable skewers or stuffed chicken breast, with produce coming directly from an onsite farm. Of course, Drake’s beers will be a major draw, too, with 50 taps pouring both classics and limited-edition, barrel-aged beers. Drake’s Barn is located at 985 Riverfront Street, West Sacramento. Hours of operation for grand opening week are: October 24, 25, and 26 from 4 p.m. to midnight; October 27 from 11:30 a.m. to midnight; October 28 from 11:30 a.m. to 9 pm. Starting Wednesday, October 31, Drake’s Barn will begin regular hours: Wednesdays and Thursdays from 11:30 a.m. to 10 p.m.; Fridays and Saturdays from 11:30 a.m. to midnight; and Sundays from 11:30 a.m. to 9 p.m.